Waldkirch, June 2018 – The new MZCG magnetic cylinder sensor from SICK has been designed specifically for use in pneumatic grippers and miniature pneumatic cylinders. Exceptionally short and with a universal range of applications, its design saves space when it is installed and fits into the C-slot of almost every cylinder and gripper profile. Not only that, but its smart drop-in fixing concept also ensures that the device is secured in place quickly and permanently, providing tensile strength and resistance to vibrations. The MZCG has a short switching point that satisfies the requirements of demanding gripper applications with short cycle times – where open, central, and closed positions (to name just a few examples) need to be detected with speed and outstanding precision, even when short strokes are being used. The connecting cable, which is suitable for drag chains, is able to withstand significant torsional forces as well as frequent and rapid changes in direction of the kind that are likely to be found in robotics applications. Pneumatic grippers and compact pneumatic cylinders – plus the MZCG, designed for end-of-arm tooling in robotics – are used in a whole host of different applications, including industrial robots, packaging machines, handling technology, and electronics for handling and mounting small parts. Developed to detect piston positions, the MZCG is a SICK solution that is responding to the growing miniaturization trend found in mechanical engineering, in drive technology, and especially in robotics. Its length of just 12.2 mm makes it one of the most space-saving magnetic cylinder sensors of its kind – and an ideal fit for the C-slots that are commonly featured in extremely small, pneumatic actuators. The short stroke movements that typically occur in ultra-compact, miniaturized gripper applications require a solution that allows sensors to be mounted easily and securely in the required position, plus a short switching point with low hysteresis. The MZCG satisfies both of these criteria – and in doing so, allows shorter robot cycle times and more efficient processes. 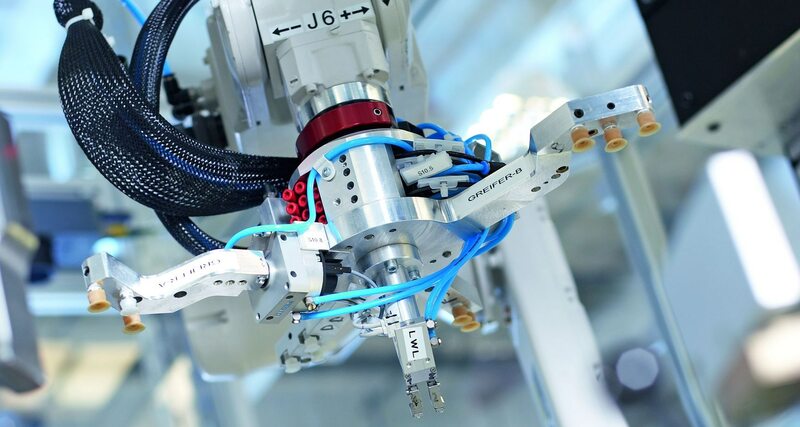 As well as this, the MZCG is ideally placed to meet robots’ end-of-arm tooling requirements, since the sensor itself is resistant to shock, vibration, and acceleration, and features a robotics cable that is suitable for drag chains and is both torsion-resistant and bend-resistant. Industrial robotics holds one of the keys to establishing automation concepts that are fit for the future – and all the more so if they are able to provide an environment in which humans and robots can work increasingly as colleagues in a range of different scenarios. In these applications, it is the sensors that give robots the ability to perceive their environment accurately – and it is this that enables collaboration on an equal footing. SICK provides the right solutions for every challenge presented by robotics. The optical and image-based systems in the Robot Vision portfolio provide the robot’s eyes, allowing it to detect humans and materials. Visual robot guidance in 2D and 3D makes it possible to deliver highly flexible and productive automation solutions in production, mounting, joining, and handling processes – such as those found in automated glue bead application, weld seam inspection, and bin-picking applications. Safe Robotics from SICK provides solutions that are designed to keep humans safe. They include all the measures that turn the sensitive area close to the robot into a safe workspace. Adaptive perception of the environment takes place with the aid of intelligent, rugged, and reliable sensors and safe systems. These enable unimpaired and safe human intervention in the robot’s working range – allowing people to work closely alongside robots and keeping them safe in the process. With End-of-Arm Tooling, SICK offers sophisticated, intelligent sensors for grippers and robotics tools, designed to keep robots as sensitive as possible and enabling them to work with fingertip precision. The portfolio covers all gripper arm applications and the feed systems associated with them. In Position Feedback solutions from SICK, the motor feedback systems integrated into the drives deliver data on speed and position as well as on the status of the drive. As a result, these smart motor sensors create the sensory foundation for all robot movements. Through its design, fixing concept, switching point accuracy, and connecting cable, the MZCG magnetic cylinder sensor has been designed with robotics and handling technology consistently in mind.